Long Island, NY - Summer is fast approaching and the Hamptons are gearing up for an exciting event season. An event that will once again stand out this summer is the American Heart Association’s 13th Annual Heart of the Hamptons Ball. This incredibly anticipated event will be taking place on the grounds of the Hayground School in Bridgehampton, NY on Saturday, June 20th. This year, the Heart Ball will honor Isadore Rosenfeld, MD, FACP, FACC, known as “American’s Doctor” and host of Fox News Channel’s ‘House Call.’ A Rossi Distinguished Professor of Clinical Medicine at Weill Cornell Medical College, Best-Selling author, and President of the Rosenfeld Heart Foundation, Dr. Rosenfeld will be awarded for his outstanding work in cardiac care. In addition, J.P. Mohr, MD, MS, Director of the Stroke Center, Neurological Institute of Colombia University Medical Center will be honored for his excellence in stroke awareness, prevention, and treatment. A special local award will be given to the Town on East Hampton for becoming the first Long Island community to be designated a “Heart Safe Community.” The event will be emceed by Bill Hemmer, Anchor for Fox News Channel. There will also be an Exclusive Preview of the soon to be released documentary King of the Hamptons, being introduced by Dan Rattiner, founder of Dan’s Papers. The Heart of the Hamptons Ball, sponsored by Merck & Co., is a fun and elegant event focused on raising funds for the mission of the American Heart Association. Friends and colleagues from NYC, Long Island and the Hamptons enjoy the beautiful setting of the Hamptons while eating delicious heart healthy foods, drinking delightful local wines and having fun with the music and dancing. The evening will consist of a “Stayin Alive” theme that will feature live music by the band ‘Millennium,’ and a DJ by East End Entertainment. A cocktail hour, sit-down dinner, as well as a live & silent auction will also highlight the night. 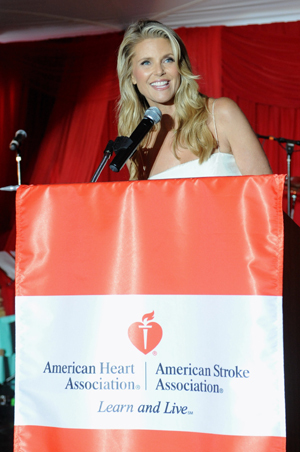 “This is an important time for our friends to give generously to the number one killer of men and women, cardiovascular disease, and to the incredible voluntary health organization, the American Heart Association” said Stephen Adler, 2009 Heart of the Hamptons Event Chair. On the morning of the Heart Ball, the American Heart Association will be hosting a forum that is free and open to the public entitled “Preventing Heart Disease and Stroke.” The program is scheduled to begin at 8:00 a.m. at the Hayground School and will include health screenings by Southampton Hospital, informational speeches by our very own event Honoree Dr. Rosenfeld and Dr. Matthew Fink. Session topics will include: “Cardio Wake-up with “America’s Doctor,”and “How to Prevent a Stroke.” A Family Fun Boot Camp by Celebrity Trainer Rebecca Kordecki will conclude the morning’s interactive health session. To become involved in the Heart of the Hamptons Ball, contact Barbara Poliwoda at (631) 734-2804. The Ball will take place from 6:00 p.m. to 11:00 p.m. Tickets are $500. For more information, sponsorship opportunities or to purchase tickets, please contact the American Heart Association at 516-777-8447 or visit www.americanheart.org. To learn more about the American Heart Association and their Start!, Go Red For Women, Power To End Stroke and The Alliance for a Healthier Generation movements, visit www.americanheart.org or call 1-800-AHA-USA1.